With the One Second Needle, sewing and hemming just got a lot more easier. It is the needle with the built-in threader. So instead of taking the thread to the needle, you take the needle to the thread. All you have to do is loop and thread. It is simple and easy. You just loop the thread and pull it up into the grove of the One Second Needle and your needle is threaded. Now you no longer have to worry about struggling to find the eye of your needle. It is great for seniors whose vision aren’t what it use to be. You can use the One Second Needle for sewing buttons, hemming pants, mending tears, burying snags and more. Whether you already a skilled expert at sewing or just a novice, it will help make the job easier. You don’t have to worry about parking multiple needles and changing thread colors is simple when using the One Second Needle. The One Second Needle comes in a set of 4 with 2 large and 2 small needles. Normally the set sells for $10 plus shipping and handling but right now you can take advantage of a special offer. You’ll get 2 additional large One Second Needles and 2 additional small One Second Needles for free. 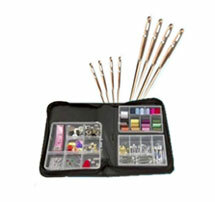 Plus you’ll even get a free 130 Piece Sewing and Mending Kit too. All you have to do is pay the extra shipping for the free bonuses.